Stephen Waarts (violin) was named co-winner of the Khuner Young Artists Concerto Competition in 2010 when he was 13 years old (he was just 12 at the audition). Prometheus enjoyed playing with Stephen so much that we asked him to return twice—first for the Beethoven Violin Concerto in D Major, Op. 61, and again for the Alban Berg Violin Concerto, “To the Memory of an Angel,” a challenging piece for a violinist of any age. While still in his teens, Stephen achieved an international reputation for his artistry, performing throughout the US and Europe, using a c.1750 Pietro Guarneri II violin, on loan through the Stradivari Society of Chicago. His repertoire includes over 40 concertos. Venues in Europe and the US have included Weimar Hall in Germany, Moscow State University, Teatro Gayarre in Spain, Oslo Conservatory, Carnegie Hall, Herbst Theater in San Francisco, Ford Amphitheater in Los Angeles, and Field Concert Hall in Philadelphia. He performed with the Staatskapelle Weimar Orchestra, Navarra Symphony, Kostroma Symphony, San Francisco Chamber Orchestra, and scores of other orchestras, including Northern California’s Prometheus Symphony, Redwood Symphony, Silicon Valley Symphony, Saratoga Symphony and Winchester Orchestra of San Jose. 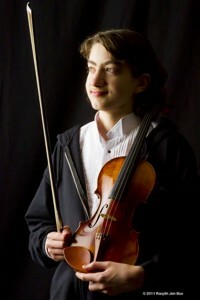 Since 2010 he has been part of the Itzhak Perlman Music Program. He has participated in the Music@Menlo chamber music program.